From left, director of recreation Scott Reid, Breckenridge Town Council members Erin Gigliello, Jeffrey Bergeron, Mayor Eric Mamula, Mike Dudick, Wendy Wolfe, Mark Burke and Elisabeth Lawrence, and tennis coordinator John O’Connor help cut a ribbon Tuesday at the new indoor Tennis Center at the Breckenridge Recreation Center. 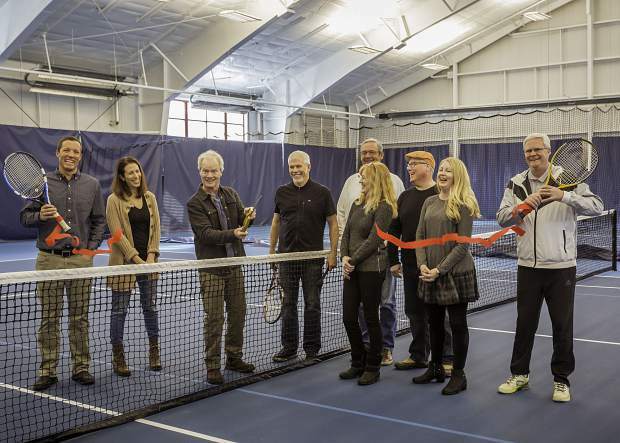 Recreation officials from the town of Breckenridge and its council cut a ribbon Tuesday on a new $3.8 million indoor tennis center that’s part of the rec center’s larger $17 million redo. New pieces of the remodel are coming into service, and now open year-round is a 17,500 square-foot tennis center featuring two indoor courts, a pro shop and locker rooms with showers. The tennis center’s been built over top of two of the outdoor hard courts, right next to the rec center, and it first opened on Friday. The tennis center is to be surrounded by six outdoor courts, including three clay courts, after a summer resurfacing project for three additional outdoor hardcourts is complete. In the larger rec center renovation, the current indoor tennis courts were converted into a new, two-story fitness space, while other improvements call for a new 2,800 square-foot youth wing that will include a year-round indoor playground, Bearly Big Child Care and dedicated youth program and activity space. The children’s wing is expected to be complete sometime this spring. The rec center is open 9 a.m. to 7 p.m. daily. To book a court, go to BreckenridgeRecreation.com. It is $32 per hour if booked online or $36 per hour if reserved in person. For more info, call the center at 970-547-7895.